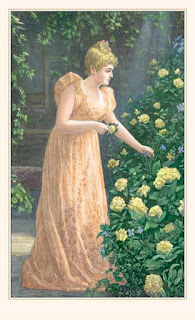 The woman in this picture stands in her garden, pruning the bright yellow rosebush. I do like the color of the roses - not bright red or even pink, no romance or dramatic gestures. No, we have yellow, a neutral color, good for many occasions. 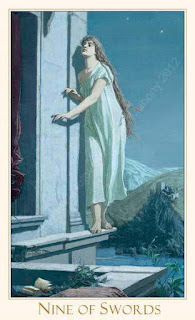 The woman's dress is loose, allowing for more movement than that of many others in this deck, from that time period. She can move and work, bring out the full potential for beauty in her flowers. Roses tend to be finicky plants, especially the kind pictured here, the ones we most appreciate in bouquets and arrangements. They require patience and perseverance of effort. You work and you wait for that work to mean something, to show. It takes time and a certain amount of faith - in your own gardening abilities and in the idea that you will be around to reap the rewards of your labors. Is it worthwhile, what we are doing? The roses certainly do look nice in this image. This was me, once. A few years ago, my last semester of college... I would climb out from my dorm room window to the ledges that led up to the the roof. It would be in the dead of night when almost no one is already up or still not asleep, when I knew there would be no one to see. I would stand at the ledge and debate with myself whether it was time, whether I was ready to do it. Not if it was a good idea or what I wanted, but rather - was now the time? Was it ok yet? Stand and stare down, racing thoughts and a distinct lack of clear emotion...and step back. Night after night, I would stand on a ledge under a darkened sky and finally step back - go inside and get back to writing and writing that thesis, those papers, always so much work. I never told anyone about these nocturnal escapades and soon graduated with some fancy latin words besides my degree. Sometimes, later, I would wish that I had let myself fall. These days I mostly try to focus on the roses. May the new year bloom, in many colors. Here is to a shining new year with much laughter and peace my friend. Did you get your noisy little package?